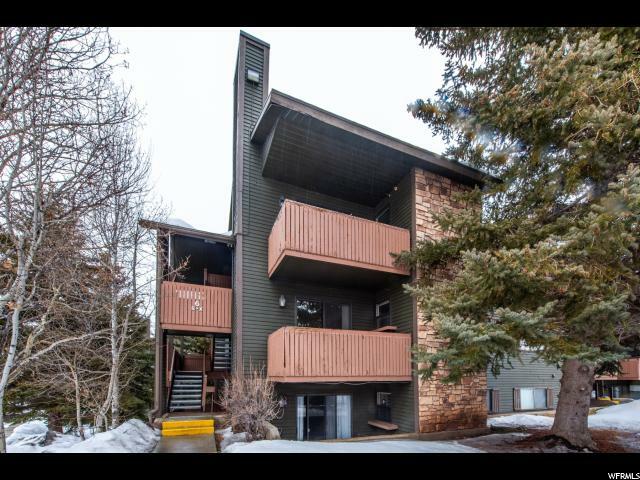 All POWDERWOOD homes currently listed for sale in Park City as of 04/18/2019 are shown below. You can change the search criteria at any time by pressing the 'Change Search' button below. "The Powderwood project is located at Kimball Junction moments away from the Factory Stores, Whole Foods, and New Park, with shopping, entertainment, and restaurants. Powderwood offers amenities such as hot tubs, an outdoor swimming pool, a fitness room, tennis courts, on-site management, and a clubhouse. It is also on the free bus route, so you can catch the shuttle to the slopes or Old Town. Unit 6V is a middle level unit with two bedrooms, one full bath, a large walk-in closet, and approximately 854 square feet of living space. It has a private balcony with views of the mountainside and Olympic Park. It has laundry facilities in the unit, a private storage unit in the basement, new carpet, and assigned carport parking. Powderwood can generate an excellent income if placed in the rental pool, or can also be perfect as a full-time residence."